Posted on August 19, 2013 by Anna C.
You’ve probably heard of MRSA, which is a strain of Staphylococcus aureus that evolved resistance to all kinds of antibiotics. You also might have heard of other “superbugs,” like Clostridium difficile, aka “C. 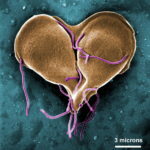 diff,” or the emerging strains of bacteria that cause antibiotic-resistant gonorrhea. However, other infectious diseases are slowly evolving drug resistance too, but they’re not grabbing headlines. One such disease is trichomoniasis. We are only starting to learn about drug-resistant trich — and what it means for those who have it. 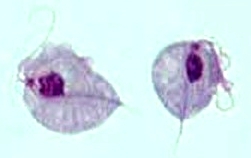 Trichomonas vaginalis is the single-celled parasite that causes trichomoniasis, or trich (pronounced “trick”). Symptoms can include vaginal discharge (which might have a bad odor), penile burning or discharge, spotting, and itching or swelling in the genital area — but around 70 percent of trich infections are asymptomatic.